There was a unique lake, because the water that filled this lake was pink. This unique lake that was located on the Recherce Island, Western Australia, indeed an extraordinary scenery. It called the Hillier Lake, this lake color really a nature miracle. If being seen from above this lake looks more enchanted and made who that saw it not to believe. The Hillier Lake, indeed very beautiful its surrounds by so many eucalyptus tree. Not only that we also can see the white sand carpet that divide the lake and the sea that not to far from the Hillier Lake. This Hillier Lake was found by an English navigator named Matthew Flinders in 1802. At that time Flinders was doing a mountain climb. After reach at the higher peak he saw the pink lake. 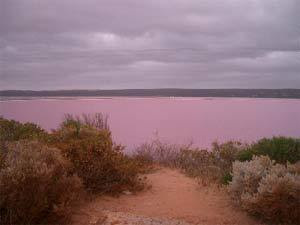 Till now no one knew what cause this lake to be pink.